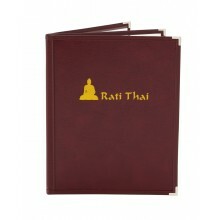 This menu cover uses a thick leatherette material that is smooth and very firm to the touch. It is a step up from our cafe menu covers, yet its flexibility still conveys a casual feel. The clear plastic inner pockets that hold your menu paper prevent your menu's ink from attaching to their inner surface and they will not crack, shrink or warp.